Snacking is a must for curbing your appetite throughout the day but make sure you’re getting plenty of protein! Who doesn’t love a tasty and satisfying snack packed with enough protein to help you build muscle and live a healthy lifestyle?… snacking can be healthy and enjoyable at the same time so you can forget about the chips and cookies (Although very tempting). There are so many great snack choices that there’s no excuse to not eat better while on the go or in just in between meals, period. But snacking on foods with no nutritional value is often detrimental to making consistent gains in the gym, and it’s also unhealthy. These are delicious and you’d never guess they were made from black beans. Even better, there’s no flour and you can make them gluten-free by substituting some ingredients. When you want to satisfy your sweet tooth, these do the job! Now, of course, there’s a slight texture difference but unless you’re a brownie expert, most can’t tell a difference. Black bean brownies are the ideal chocolaty high protein snack! Make a batch and find out just how amazing these black bean brownies are! How about a cookie dough not made from cookies?… it sounds strange but there really is a Garbanzo bean recipe which has the same taste and texture as real cookie dough. But it’s much healthier! 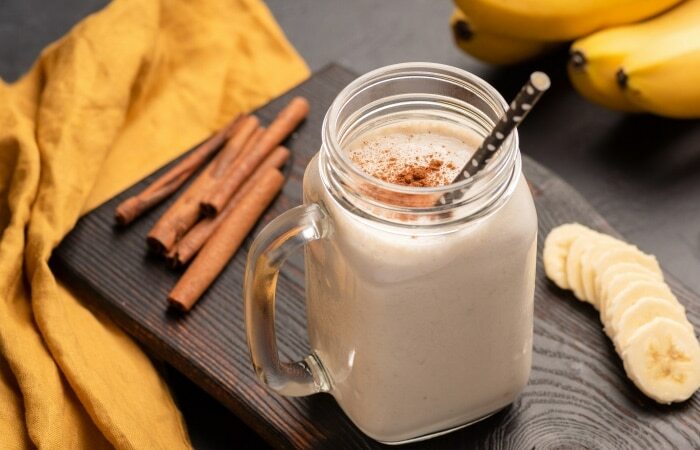 You can add chocolate chips after you blend the ingredients together but opt for a sugar and dairy free kind to keep the recipe extra health-friendly. 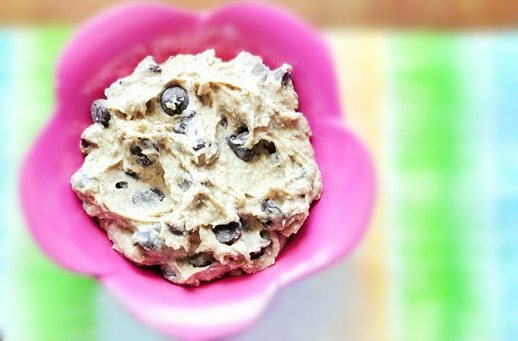 And the best thing about this cookie dough alternative is you can eat it raw and not worry about getting sick, unlike real cookie dough where Salmonella is a concern. Protein: There are approximately 20 grams of protein per ½ cup of Garbanzo beans. 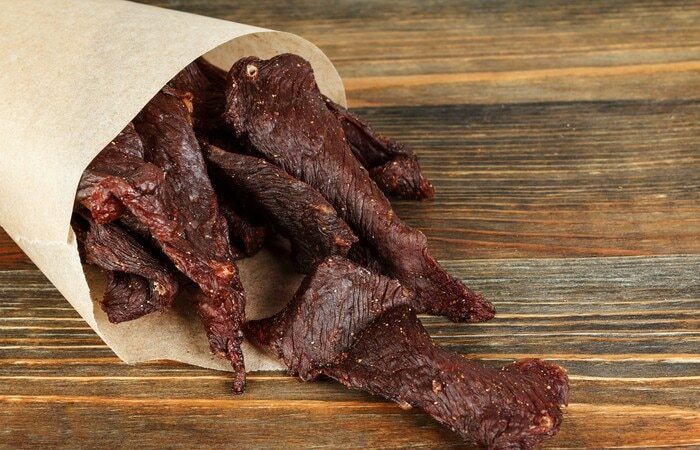 If you need your meat fix then jerky is your answer. It’s not only delicious but it’s packed with protein and the options are endless. Try to get the low sodium kind with little to no preservatives and low sugar so you can snack in a healthier manner. You can get any type of meat you want in jerky, so next time you’re at the grocery store, check out the great options and flavors. Hummus is a delicious dip, or topping, made from Garbanzo beans and plenty of delicious spices/seasonings. Now, the flavor choices and variety of ingredients in hummus products can be overwhelming but we’re sure you’ll enjoy experimenting with all the options. Or, you can even make it yourself. 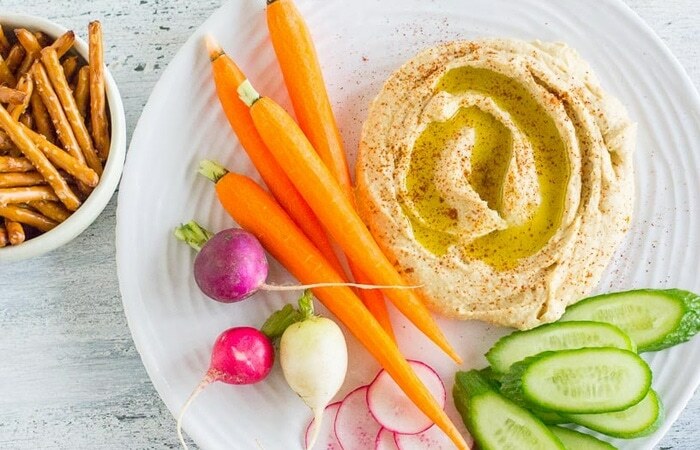 But, whichever option you choose to go with, make sure you have some crunchy vegetables to dip in your hummus like celery, peppers, carrots etc. Snacking is so much more enjoyable when you combine food to make one delicious snack. This is one of the tastiest and healthiest snack ideas available. Almond butter and banana slices on a rice cake satisfy the cravings for unhealthy desserts and you won’t feel guilty. Spread your desired amount of almond butter on a rice cake and place banana slices on top for this quick and easy snack. Trail mix is usually a mix of nuts, seeds, fruits etc. and there’s plenty of protein too. Try to choose a trail mix with limited to no added sugars to keep your snacks as healthy as possible. Protein: There are about 21 grams in one cup of trail mix. (10)(11)(12). Protein shakes are possibly one of the most convenient options for getting in 20+ grams of protein on the go. They’re a very popular option for workout nutrition especially before or after a workout and they do help with building lean muscle. Now, the flavor choices are endless but the number of quality products is not, so make sure you buy from a reputable company who puts out quality products. The best way to know if a product is made from quality ingredients is to read about the company and see what others are saying. But, there are many great companies out there and you can find them by simply doing your research. There’s no one size fits all option when it comes to nutritional supplementation. Just add two scoops of powder with your desired choice of liquid and either shake it up or blend it if you’re adding more ingredients. Tip: Add less liquid at first so the shake doesn’t become too watery. Then you can slowly add liquid to find the desired consistency. All you need is your favorite plain yogurt and a scoop of protein powder to make a tasty and healthy dessert. Nonfat Greek yogurt is a great option since it’s pretty healthy but always opt for the kind with little to no added sugars to keep things as healthy as possible. Just add your favorite protein powder and mix it into your yogurt until you get a desired pudding-like consistency. It’s a quick and simple snack on the go or you can eat it at home in between your regular meals. Protein bars are probably the fastest and easiest snack out there when you need a lot of protein quickly. Now, since there are so many different flavors and versions available, you are tasked with finding one which tastes good and is healthy for you. But fortunately, most Quest bars taste pretty good and they’re made with relatively healthy ingredients. Protein bars are also great right before or after you get in a workout. Protein: A Quest bar contains about 20-21 grams of protein. 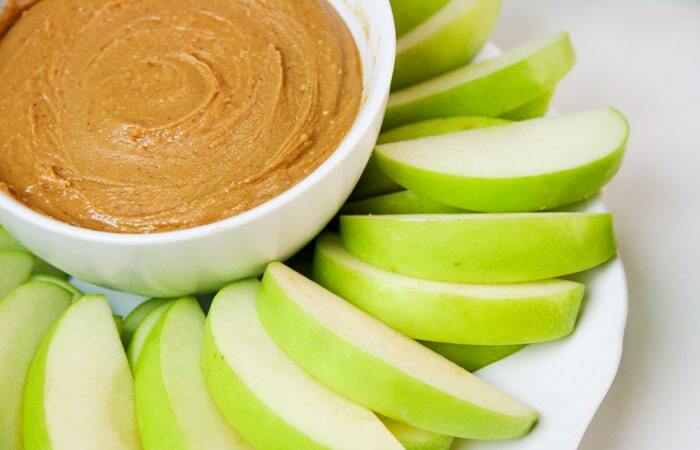 Although apples contain barely any protein, they still make a good dipper for peanut butter. It’s a tasty snack that’s been around forever and has become pretty common as a snack combination. The crunchiness of the apple with the nutty and creamy peanut butter is a winning combo. You can eat cottage cheese plain or add some fruit to make it more flavorful but either way, it’s a tasty, yet healthy snack. 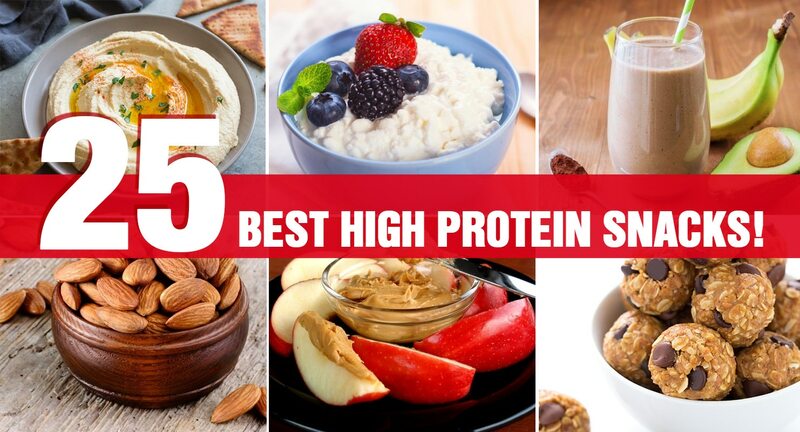 Some people like it and some don’t but it may be a texture you have to get used to, however, it’s one of the best, quality protein sources for a snack. You can’t beat boiled eggs for a healthy, all-natural snack. Plus, you can mix eggs in your salads or have them any way you like, and they’re a very high-quality protein source. Just sprinkle a little salt and pepper and you’re good to go! Most edible seeds are a tasty and enjoyable way to get your protein in when you feel like snacking. But pumpkin seeds are especially delicious and are high in protein. Roasted pumpkin seeds are simple to make… All you have to do is mix 1 ½ cups of raw seeds in 2 tablespoons of butter, add a pinch of salt, and bake at 300 degrees for 45 minutes on a baking sheet. Cashew cheese? Oh, don’t worry it’s actually pretty yummy and is a perfect dairy-free alternative to regular cheese. But it does well as a dip too and you can either make it yourself or buy it a health grocery store. We’ve come so far regarding food creations that you can enjoy your favorites while eating much healthier while sticking to a diet plan or lifestyle. Ezekial bread is made from sprouted grains and legumes. It’s not only a healthy option because there are no added sugars but there’s also a respectable amount of protein (4 grams) in each slice. It makes perfect sandwich bread and two slices will give you twice the protein. 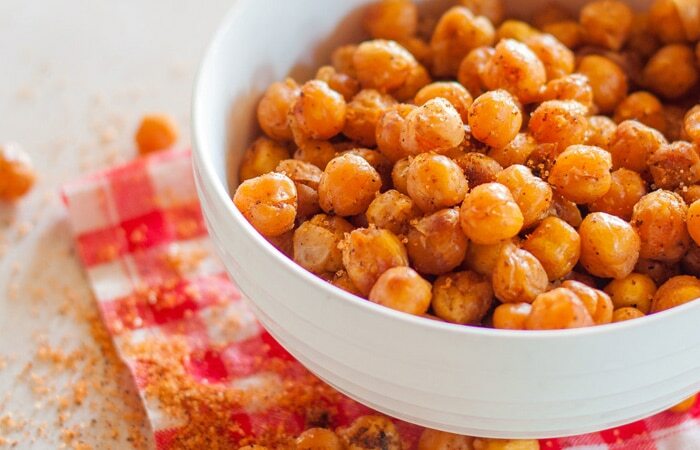 Roasted Chickpeas make a nice, healthy snack and although there are several ways to eat them, roasting them is among the most popular. Tempeh is a very popular fermented soy product often used as a meat alternative since the textures are similar. Vegans and vegetarians consume a lot of Tempeh because it has a lot of vitamins and nutrients plus plenty of good quality protein. Using a few slices of wheat bread will increase the protein content even more. Yes, you can eat your cookie, and have milk too… Lenny and Larry’s cookies are pretty healthy and they contain a lot of quality protein… 16 grams for a cookie! But it gets even better for the health conscious people as a cookie has 10 grams of fiber, and it contains no dairy, soy, or eggs. Lenny and Larry’s cookies do not contain artificial sweeteners either. Protein: 1 cookie has 16 grams of protein. Possibly the most fun protein snack ever… string cheese is satisfying because it tastes great, and you can peel the string as much as you want to make the fun last even longer. And the great thing is you’re getting your protein from a good source. Now, obviously, not all cheese is created equally so find string cheese with low fat, and minimal added ingredients for a super-healthy snack option on the go! Protein: There are 7 grams of protein in your average string cheese stick. Lean turkey, ham, chicken breast… all of these are loaded with protein and make perfect sandwich meat. Plus, it’s very easy and convenient to make a sandwich which is why so many people choose it as a snack option for on the go or a quick meal. But here’s the catch… most of the deli meat found in grocery stores whether on the shelf or in the deli is processed to some degree. So, if you want the healthiest sandwich meat options, make your own and slice it up for sandwich meat. Protein: There are 54 grams of protein in one skinless cooked chicken breast (172 grams). It’s hard to beat the convenience of Tuna in a can or pouch and you can mix a little bit of light, low-fat mayonnaise to make your snack even tastier. Now, cucumbers will replace your crackers, to up the healthiness, and they make a good, crunchy alternative for guilt-free snacking. But make sure to get a light Tuna if you’re going to be eating this snack frequently because you don’t want to consume too much mercury which is found in Tuna, as this is not healthy or safe. Also, opt for the Tuna in water rather than in oil. Kind bars are made from all real foods like almond butter, unsweetened chocolate, and peanuts which means they are an excellent source of protein. Plus they taste amazing and nothing like a typical protein bar. Now, each bar does have 17 grams of fat which may be a little high for some people so just something to be aware of. Plus, there are peanuts, milk, and soy in each bar for those who may be allergic or intolerant to these ingredients. Granola is a great all-around snack that provides you plenty of protein, carbs, and fats to fuel your active lifestyle, or it just makes a good snack in general. Plus, you can add it to your cereal, yogurts, protein shakes etc. Now, since there are so many varieties, try to find one with peanut or almond butter for your protein source. The more natural the granola the better, so choose a product with healthy ingredients and little to no added sugars. But, of course, the healthiest option would be to make the granola yourself so that you know exactly which ingredients you’re putting into it. Protein: It depends on the kind of yogurt and granola but there are roughly 15 grams of protein for a half cup of Greek yogurt and granola. 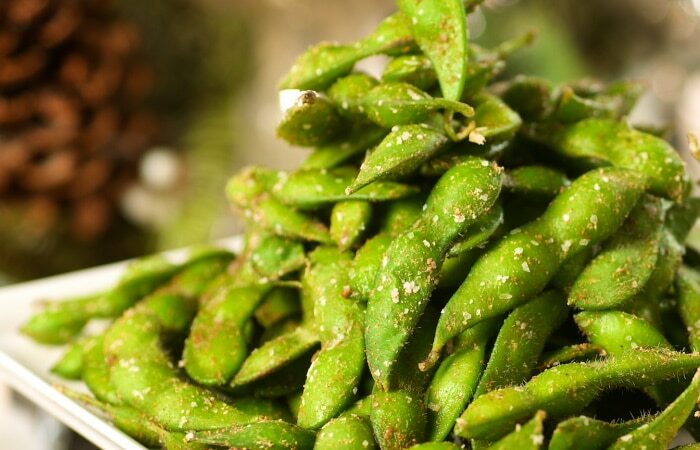 So, Edamame is actually the preparation of immature soybeans in the pods and you can either steam or boil them for a delicious high protein snack. It’s easy to make and you can prepare a bunch at a time so you can snack on them through the day when you’re on the go. And the last tasty high protein snack on our list is the “No Bake Chocolate Energy Bites”. These are fantastic and will give you your sweet fix when you’re craving a tasty morsel. Take them on the go or have them as a late night snack but either way, they’re a great protein source. The recipe makes about 20 bites. Protein: There are about 2 grams of protein per bite. Osterweil, Neil. The Benefits of Protein. WebMD. Retrieved 2019-03-23. Hummus, home prepared Nutrition Facts & Calories. nutritiondata.self.com. Retrieved 2019-03-23. Nuts, almond butter, plain, without salt added Nutrition Facts & Calories. nutritiondata.self.com. Retrieved 2019-03-23. Nuts, almonds [Includes USDA commodity food A256, A264] Nutrition Facts & Calories. nutritiondata.self.com. Retrieved 2019-03-23. Nuts, pistachio nuts, raw Nutrition Facts & Calories. nutritiondata.self.com. Retrieved 2019-03-23. Nuts, cashew nuts, raw Nutrition Facts & Calories. nutritiondata.self.com. Retrieved 2019-03-23. Flynn, Albert (2003-11). “The role of dietary calcium in bone health”. The Proceedings of the Nutrition Society. 62 (4): 851–858. doi:10.1079/PNS2003301. ISSN 0029-6651. PMID 15018485. Boyer, Jeanelle; Liu, Rui Hai (2004-05-12). “Apple phytochemicals and their health benefits”. Nutrition Journal. 3: 5. doi:10.1186/1475-2891-3-5. ISSN 1475-2891. PMID 15140261. McKiernan, Fiona; Lokko, Phoebe; Kuevi, Anna; Sales, Regiane L.; Costa, Neuza M. B.; Bressan, Josefina; Alfenas, Rita C. G.; Mattes, Richard D. (2010-8). “Effects of peanut processing on body weight and fasting plasma lipids”. The British Journal of Nutrition. 104 (3): 418–426. doi:10.1017/S0007114510000590. ISSN 1475-2662. Cheese, cottage, lowfat, 1% milkfat Nutrition Facts & Calories. nutritiondata.self.com. Retrieved 2019-03-23. Holt, S. H.; Miller, J. C.; Petocz, P.; Farmakalidis, E. (1995-9). “A satiety index of common foods”. European Journal of Clinical Nutrition. 49 (9): 675–690. ISSN 0954-3007. PMID 7498104. Zaineddin, Aida Karina; Buck, Katharina; Vrieling, Alina; Heinz, Judith; Flesch-Janys, Dieter; Linseisen, Jakob; Chang-Claude, Jenny (2012). “The association between dietary lignans, phytoestrogen-rich foods, and fiber intake and postmenopausal breast cancer risk: a German case-control study”. Nutrition and Cancer. 64 (5): 652–665. doi:10.1080/01635581.2012.683227. ISSN 1532-7914. PMID 22591208. Ristić-Medić, Danijela; Ristić, Gordana; Tepsić, Vesna (2003). “[Alpha-linolenic acid and cardiovascular diseases]”. Medicinski Pregled. 56 Suppl 1: 19–25. ISSN 0025-8105. PMID 15510909. Chickpeas (garbanzo beans, bengal gram), mature seeds, cooked, boiled, without salt Nutrition Facts & Calories. nutritiondata.self.com. Retrieved 2019-03-23. 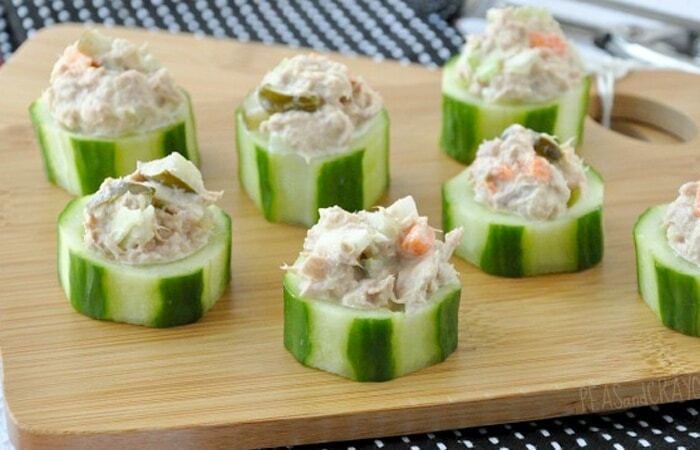 Fish, tuna, light, canned in water, drained solids Nutrition Facts & Calories. nutritiondata.self.com. Retrieved 2019-03-23.